That email came from John 'one Grammy - no orchestra' McLaughlin Williams. Why do so many superstar conductors turn out to have feet of clay when they step off the podium? Post publication clarification - see discussion in comments below and in particular input from John Von Rhein, whose Chicago Tribune piece prompted John McLaughlin Williams' email. I guess the moral is take what you read in newspapers with a pinch of salt. I don't think the Chicago Tribune's translation from Italian correspond exactly to what Muti said. All you can find in the Italian press is that Italian State takes half of the income of the prize - because of course there's a tax for those things - but that doesn't mean he's using the money for pay any other taxes. Thanks for that Valinara. More information via readers from the Italian press or elsewhere would be appreciated. After receiving Valinara's comment I contacted John Von Rhein, whose Chicago Tribune piece prompted John McLaughlin Williams' email. Here is John Von Rhein's response. It wasn't our translation - it was Musical America Online's. Apparently Muti's remarks to the Italian media got distorted in transatlantic communication. 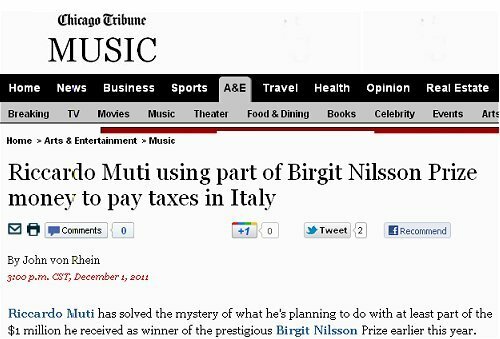 Apparently the maestro actually said something to the effect that he's happy to do his duty as a good Italian citizen and pay his proper Italian taxes on the Nilsson Prize money. I'm on deadline now, so no time to comment further. I'd simply recommend your ignoring the Tribune article and the musicalamerica.com original. What a difference a translation can make. Please forgive my indignation, and I must say I am relieved. The mere thought of using an honorable award that way is outrageous, and I am very glad it's untrue.